Anime. Video Games. Comics. Manga. Programming. Did I mention anime? I been in love in anime since I can remember. But, I became a fanatic more than ever in recent years and its been heaven. I can describe myself as an anime explorer, or a big weeb that has a lot of time in the world. I always enjoy something new. That's all there is for me unless you guys want to PM or something. Now, I don't really have a favorite genre per say, but I do tend to gravitate towards action. But overall, I can watch any show as long as it is good. I should try to be more active here but then again binge watching episodes of anime are very fun so I tend to forget :) But, at least I'll try. 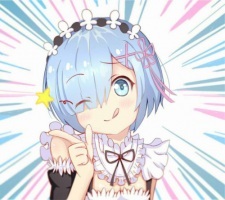 Last but not least, Rem is best girl. Finished it the other day, so glad I did! I hope season 2 is just as good if not better, and Ram gets more screen-time cus I feel like she's seriously underrated. Chika is amazing, but honestly I love every Kaguya-sama girl! o nice so I was right about the MiA movie covering bondrewd's arc, will you read the manga before watching the movie? Well, one of the shows that I'm hyped for is already a given(?) xD And then there are some new anime from Spring 2019 that I plan to pick up and watch weekly, but probably only a few shows. As for the outgoing series, I watch Yakusoku no Neverland, Sao: Alicization and Tensei Shitara Slime Datta Ken (from what I know it goes on but I'm only on episode 14).